I am Michael J. Rousseau, and I believe everyone deserves an aggressive defense of his or her rights regardless of the criminal charges he or she is facing. In 2005, I decided to start my Belleville, Illinois, law firm to better protect the rights of the accused as a private criminal defense attorney. I began my career in 2001 as an assistant prosecutor in the state's attorney's office, and later, I became a public defender for St. Clair County handling a wide variety of criminal defense cases. As an experienced criminal defense attorney my only concern is that your rights are not violated in any way. I work to ensure you are treated fairly. My law firm has successfully handled hundreds of criminal defense cases including DUI/DWI, drug crimes and weapons charges. In every case I take, I gather the necessary information, interview any witnesses, and perform a thorough review of the case to determine if any errors were made by the arresting officer. If you have been arrested for a criminal offense, it is important to contact an experienced criminal defense attorney as soon as possible, preferably before speaking with the authorities. Off-site appointments can be arranged and credit cards are accepted. Payment plans can also be arranged, and most cases are taken on a flat fee basis, so you know what to expect from the beginning. My law firm offers a free, confidential initial consultation, and I am available by telephone 24 hours per day, seven days per week. 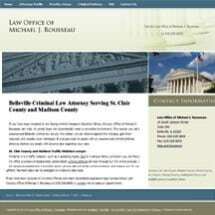 Contact the Belleville, Illinois, Law Office of Michael J. Rousseau to discuss your case today. Representing clients in their criminal, personal injury, family law, and real estate legal matters. Visit my practice areas page to learn about the different legal matters that I represent. I understand the emotions involved and will calmly listen to your case and provide straightforward, thoughtful advice on steps you can take to mitigate the fallout from an arrest. An experienced St. Clair County DUI/DWI defense attorney can prove invaluable if you are concerned about keeping your driving record clean and minimizing the fallout from an arrest. Read my attorney biography for more information about my legal experience.